It’s a fishing tale with teeth. Over the Labor Day holiday, Tracy Brown and his two friends, James and Joe Fink, set out from Smith’s Fish Camp on Escambia River in search of big game. “James has seen this alligator for eight years,” Brown said. “They’re avid gator hunters. I ended up hooking up with them and we went out to Escambia River. The small group spotted the gator just a short ways north of where they put in at Smith’s Fish Camp and, after a grueling three-hour fight, had nothing to show but broken hook lines. The trio finally harpooned the gator and began wrestling it into the boat. “We kept pulling and pulling,” Brown said. “Little-by-little, we finally pulled him in the boat. 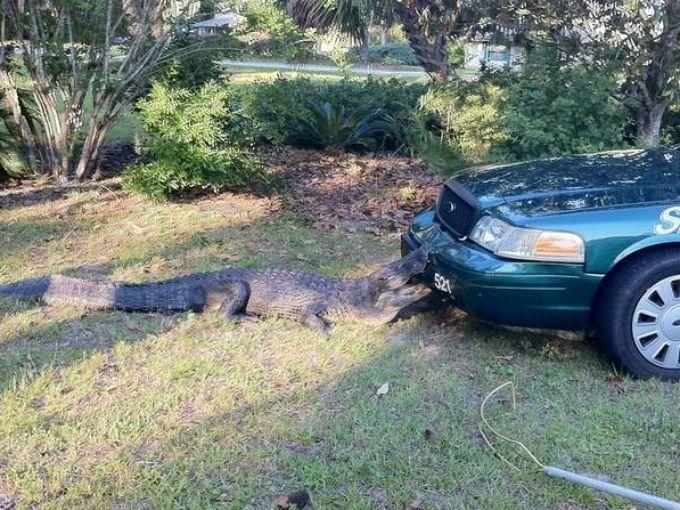 The shock Florida Wildlife officials had was nothing compared to the shock Brown’s girlfriend received when he arrived home with his prize.